Sarah admits to flipping and the six feel pretty decent about staying together and picking off the former majority alliance. That is until on a feast/sleepover Reward, when Andrea doesn't like that Zeke and Brad are getting chummy while bro-ing out over football. A helicopter ride and a Lazy Susan covered with chicken wraps, eggs, and cheesecake can't distract Andrea from this fraternization with two people she doesn't trust. 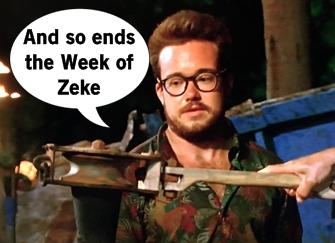 Aubry also notices this new friendship and upon returning from the Reward, the whispers about targeting Zeke begin. Sarah's still stuck in the middle of both sides and plans to vote wherever she thinks she'll get ahead. Sarah make a gesture of trust with Cirie to reveal her vote advantage, but Sarah is close to Zeke and hopes to keep him around. Zeke begins conversations with Brad and Troyzan to hopefully turn the tables. Tai feels most vulnerable and despite rockin' two Hidden Immunity Idols, he doesn't want to play them. And Sierra knows she's the next to go and approaches the other side to save her, willing to vote for whoever they want. But not Andrea again because she wins Immunity. Andrea and Cirie begin to hatch their plan to vote off Zeke, which Aubry agrees with, but Sarah isn't excited to lose her tight ally and Michaela doesn't like losing a number. What's an alliance to do? Tribal Council time! Sarah tells Probst that she owned up to flipping last vote to take out Debbie. The four of Brad, Tai, Sierra, and Troyzan admit they feel very vulnerable without the numbers. There's questions of whether the six will stick together and lots of mixed messages are shared. Zeke explains the timing isn't right for a move at this time. While everyone can debate their value, it sounds like there's so way to actually sway the vote but they're willing to listen. This all leads to Probst's buzz word of the night about the heart being on or off. There's probably a mixed bag of heart powers in this week's vote as the alliance of six turns on their own and votes Zeke out of the game.